So, you're all setup, the printer is built and the electrical is wired and you want to print some. The itch is really getting to you. But what does one print out and where does one get files to print. One of the best places for getting files to print is from Thingiverse. Before we get the printer all cranked up, we have a few things that need to be done. The printer circuit board comes preloaded with the firmware needed to get the printer printing. In reading through the posts on the Tevo Facebook group, I decided to upgrade the firmware to Marlin Firmware. The firmware upgrades have to be performed with the aid of an Integrated Development Environment of better known as an IDE. There is a lot of IDE's, but the one to use is the Ardunio IDE. You can download a copy of it for you particular Operating System here. Version 1.8.5 was the flavour of the day at the time of this writing. 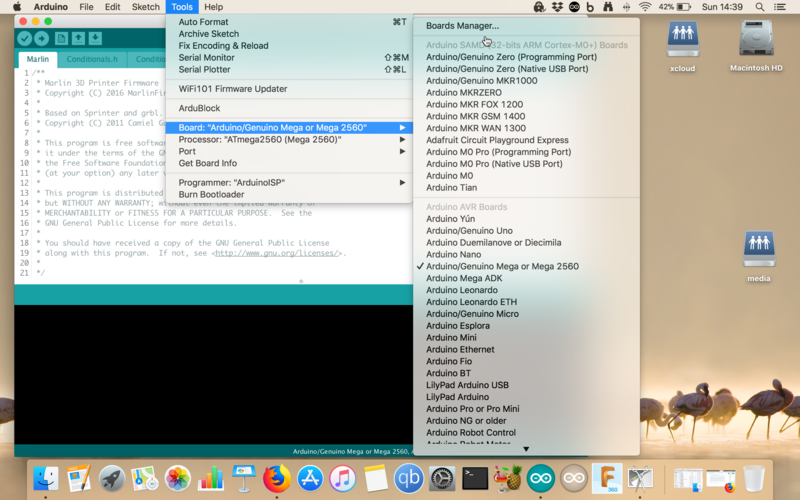 Once downloaded and installed, start it up and use the menu and navigate to Tools>Boards>Arduino/Genuino Mega or Mega 2560. The Arduino Mega 2560 has the same processor as the circuit board on the Tevo Tarantula printer, hence the reason for the use of the Arduino IDE. Once the board has been selected, you need to connect the USB cable that came with your printer to the computer. When you click on Tools>Port, you should see the board and you just have to highlight it. The menu item Tools>Processor can be left as it is. 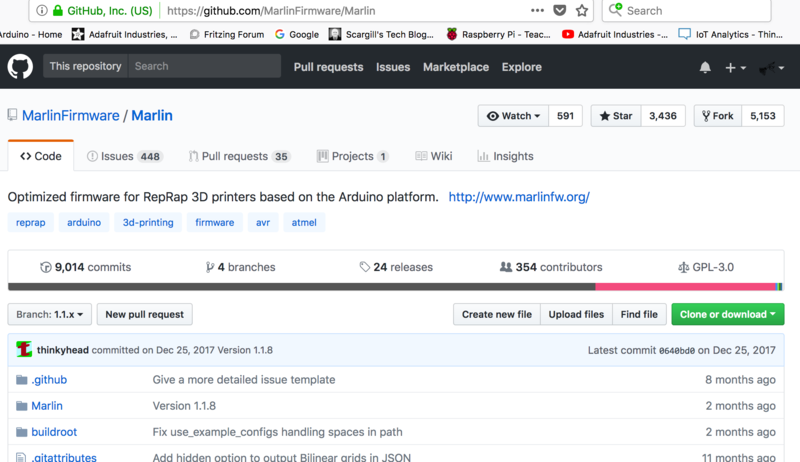 Head on over to Marlin Firmware and download the firmware by clicking on the green download button. Read the instructions that displayed on the page. Once downloaded, unzip the file making note on where it is located. What I like to do is move the unzipped directory into the Arduino directory. In Mac that is /Users/user/Documents/Arduino/, Linux /home/user/Arduino/ and Windows /User/Documents/Arduino/ (I believe). 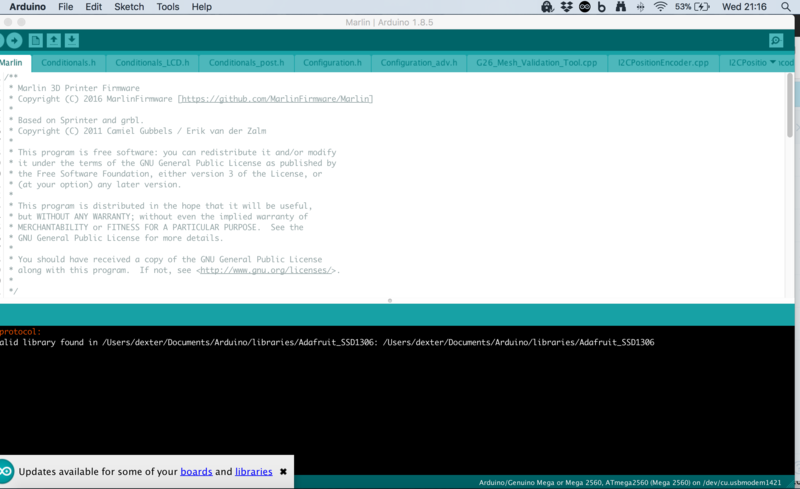 Now open the Arduino IDE and click File>Open and navigate to to where the directory was placed. 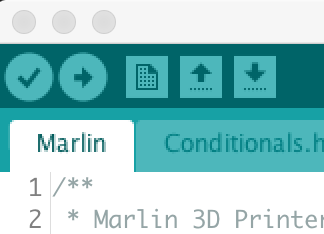 This should look similar to this once you drill down into the ../Arduino/MarlinTarantula-EasyConfig-1.1.x/Marlin/ and locate the file Marlin.ino. these .ino files are known as sketches in the Arduino IDE world. Don't worry about the Updates pop-up in the bottom left of the screen if it shows up there. Now at this time, I would just leave everything the way it is and upload the sketch to the circuit board and see how things go. Once one gets use to the process of uploading the sketch and playing with the LCD, you can try to change things to meet your needs. In order to upload the sketch, you must have your printer connected to the computer, the printer needs to be recognized under Tools>Port in the IDE. If these are all good, then you click on the "right arrow" as seen in the image above. There will be lots of text scrolling up in the lower, black area, of the IDE window. As long as you don't get a bunch of Orange text in the lower black area, you should be good to go. There are lots videos on Youtube. The last thing you need to do before you sent that first print to the printer is to level the bed. This is very important and should not be over looked. You should give the bed a quick leveling prior to all prints. Once you've done it once, it will be like riding a bike. Level Bed. I use a small piece of paper and with the falling procedures. Using the LCD, press the button down and select "Prepare". The scroll down and select "Home Axis". You should here the printer move around. Once the printer has homed, scroll down on the same menu and select "Disable steppers". The bed can now be moved freely, but do it slowly as the electricity can back feed into the main circuit board. Move the bed so the left front corner (0,0) is directly under the nozzle. Place the paper between the nozzle and the bed. Adjust the bed so the piece of paper as a bit of friction between the bed and nozzle. It does take a bit of feel. You then move the nozzle to each of the other 3 corners adjusting each in the same manner. Then repeat the process again. Give your print a go. You can either use the USB cable connected to the printer board or save the file to the SD card that came with the printer. The choice is yours, I prefer the cable to the printer method, but go a head and try both. I just find moving the SD card around a bit of a pain. The cable connected is a bit easier. Now, something I've not touched on is how do you get the file you downloaded from Thingiverse or wherever else you my get them. The file I use is the stereolithography file or .stl for short. These files are the most common form for moving your project to the printer. These files need what is called a slicer to get the CAD file from the computer to the printer. There numerous slicers and a quick Internet search will give you a list of free and paid versions to which you can make a decision on. I like to use Cura. I seems to just work for me. There are a million tweaks to do to the software and that is a whole other topic. I have looked a Slic3r, Repetier, Ideamaker and Ponterface. In Cura, use the open file and find your stl file and open it up. As I said, there are a million tweak you can do, use the recommend settings for now. I use the "fine" profile and this seems to work just fine. It should tell you how long it will take to print and the options of where to print. SD card, to a file or to the printer via USB. Don't get too excited, most of the prints take hours. I even looked a print for my son that was going to take 3 days plus! Remember, there are lots of resources on the Internet. Play around and have fun.